Kevin and Deborah have been making Kaleidoscopes since the early 1990's. The first Kaleidoscopes they remember were the cardboard toys passed among friends in some endless childhood summer under the willow trees between stickball games or tea parties. As jewlers Doborah and Kevin share a fascination, perhaps obsession, with the sparkling colors and facets of gems. 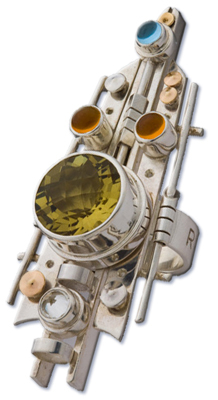 When they began making jewlery scopes their 25 years experience in design found a new focus. Sundays @ Santa Barbara Arts and Craft Show, Chase Palm Park Cabrillo Blvd Santa Barbara, CA Space 20-25 Craft Section.